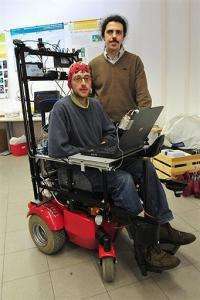 Professor Matteo Matteucci (R) and Ph.d student Bernardo Dal Seno (C), wearing a skullcap mounted with electrodes and wired to a computer as he sits on a special wheel chair at the Politecnico di Milan department in Milan. Italian researchers have developed a wheelchair that obeys mental signals sent to a computer, they said Friday. Italian researchers have developed a wheelchair that obeys mental signals sent to a computer, they said Friday. The researchers at Milan's Polytechnical Institute artificial intelligence and robotics laboratory took three years to develop the system, Professor Matteo Matteucci told AFP. The user is connected to a computer with electrodes on his or her scalp, and sends a signal by concentrating for a few seconds on the name of the desired destination -- kitchen, bedroom, bathroom -- displayed on a screen. The computer then guides the wheelchair to the selected room using a preset programme. "We don't read minds, but the brain signal that is sent," Matteucci said. The chair is equipped with two laser beams that can detect obstacles. The Milan lab is already in contact with companies that could produce a commercial prototype aimed at quadriplegics, Matteucci said, adding that it could take between five and 10 years. Such a wheelchair would cost only 10 percent more than a classic motorised wheelchair, according to the institute. Research to develop the so-called Brain Computer Interface began in the early 1980s around the world. Matteucci said a handful of other researchers were working on similar projects to his, including the Federal Polytechnic School in Lausanne, Switzerland. "Eventually, a research consortium should be set up that will use all these projects as a basis for finding the best approach," he said. "We've now started work on getting the chair to operate outdoors using a GPS," Matteucci added.